It had been 4 years since I had been religiously covering it. But not this year. This year, I wanted to pass the baton to someone else. I wanted to hear the story but from the other side. And... it didn't take me long to circle who that someone else would be. How about my dear blogger friend, Eli @ Expat Liv? An expat journalist and writer from Norway living in Mumbai since the past two years? I thought. It would be nice to hear what she feels about the Ganesh Chaturthi festival. Being a regular reader of her blog, I already knew her love for India and that she connected with the festivals and cultures of the country at the same emotional level that I do. Thinking thus, I immediately set off to shoot her an e-mail requesting if she would like to be a guest on My Yatra Diary... and pen down something on Ganesh Visarjan and the festival from an Expat's point of view? And voila, there she was, in the midst of flying in from Goa and flying out to Europe, all excited to make some time and honor this little corner of mine. I simply couldn't stop feeling grateful and thanking her for this kind gesture of hers. 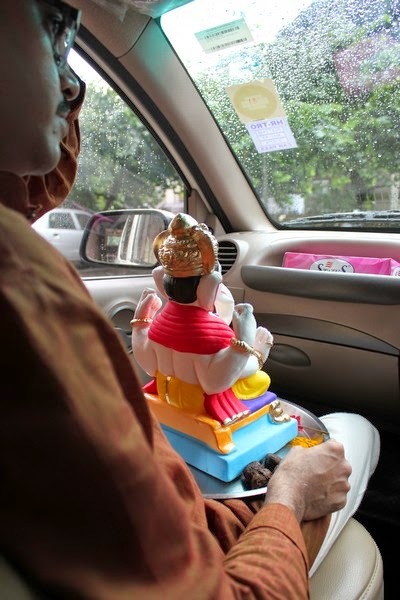 So on that note, there we go -- sit back, relax and read all that the festival of Ganesh Chaturthi means to an expat, from an expat's point of view -- rest assured, Eli is the kind of writer who shall leave you wanting for more! When I was invited by dear friend Arti to write about Indian festivals in general and Ganesha in particular, I could feel a huge smile spreading on my face. Because even long before we moved to India over 2 years ago, I had a vision of the Indian festivals. Colorful, noisy, wild, crazy, fun and with crowds of happy people drumming and dancing all over, all the time. I was not disappointed. The festivals here are all that - and so much more. And the Indians make it easy for a curious soul like me to take part. In the start I was a bit intimated by the huge crowds, but my attempt to keep a low profile for me and my camera failed every time. Smiling faces, gentle hands invited me in, to come forward, so I could see better. Sometimes so they could get a picture of me also, because like some said: We have not seen a foreigner in real live before. Ganesha is worshiped in India as the God of wisdom, prosperity and good fortune, and is invoked at the beginning of a new venture or at the start of a journey. He is the one to pray to if you need to remove any obstacles that are in your way. He is seen as the most important Hindu God, and a God for everybody. 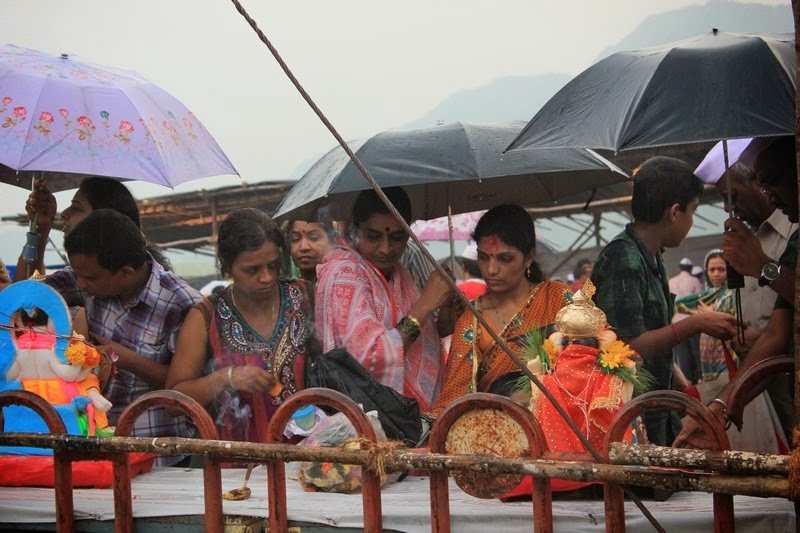 During this week, he is worshiped, and then immersed in the sea, a lake or the river at the end of the festival. It’s so empty in our house now, little Sweetha says to me. I see sadness in her big brown eyes and she sighs as she looks down at the small lump of clay left on the tray - where Ganesha had been. And I get it. It is the relationship. It is strong and emotional. The elephant - headed God Ganesha is an integrated part of peoples’ lives. Of their joy, hope and belief. And I feel blessed to be a part of it. To see it and to feel it. It is intense and wonderful. Even before the festival starts, great excitement is in the air. 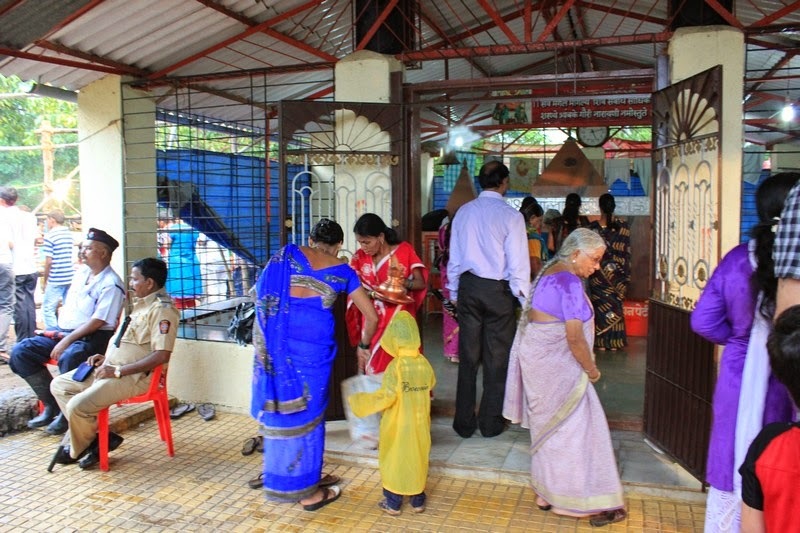 Families pick out their Ganesha statues to be painted and made like they want it, and they shop for lights and decorations. 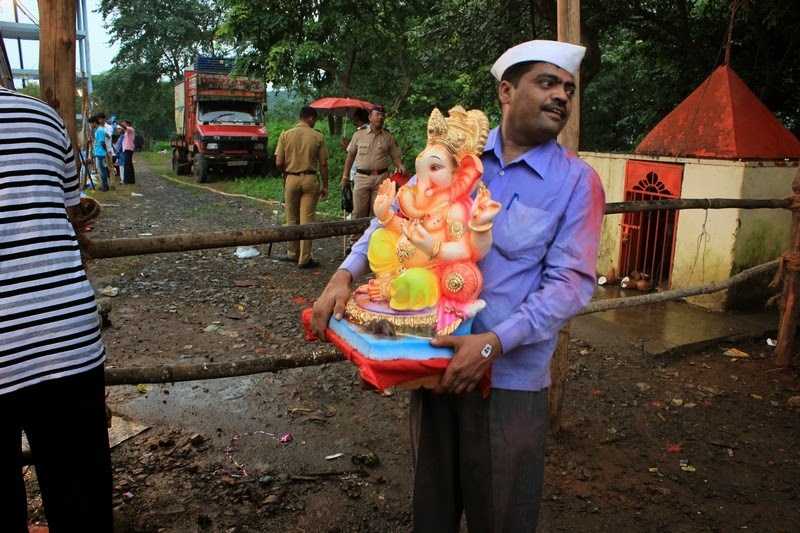 Then comes the joyful day when they bring their Ganesha statue home. It’s like we are bringing home our mother or father, a friend said to me ecstatic, - we are so happy! 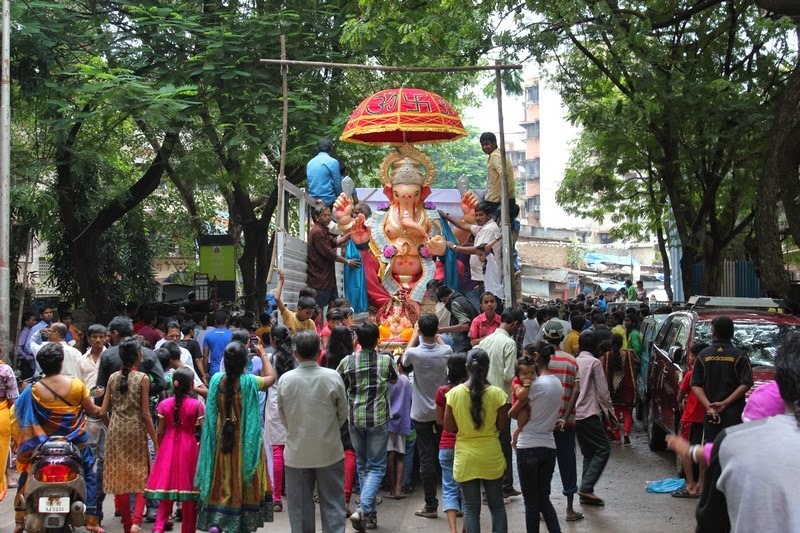 All over Mumbai there are processions with people carefully carrying their Ganesha home, accompanied by crowds of singing, dancing and drumming people. Ganesha has arrived, he will stay for 1 1/2 or up to ten days, and he cannot be left alone. I found it pretty funny the first time I heard that people actually took time off from work, to stay home to keep Ganesha company. Now, I get it. I can feel the intense joy in Ganesha’s presence. There is a constant flow of family and friends coming to give offerings of fruit, flowers and sweets and they share food - all for him. A lot of joy, fun – a constant celebration. When we come to the local lake, we find ourselves in a constant flow of people, following their Ganesh to the final journey for this year. Some are dancing to the drums, and most are shouting: Ganpati Bappa Morya, Purchya Varshi Laukariya (O Father Ganesha, come again early next year). The atmosphere is electric. To my surprise, I hear myself shouting along as well. It’s a chaotic spot, from an expat’s point of view. There is music and drums, and all around us small Ganesha processions appears - on foot, from rickshaws and from cars - and they all head up the hill, towards the lake. So do we. And like the others, we also stop to do a final offering, which includes breaking a coconut, the symbol for human ego (a hard nut to crack). Only to use force and do your best - to break your ego, you will overcome obstacles and release your inner energy. I like that. People are walking around, offering each other fruit, nuts and sweets. - Ganesha is the God for everybody, and this is blessed by Him. Like one big street-party really, except for the fact that we are here to bid farewell to someone. Everybody shares sweets,nuts and fruit. Final offerings – a sad moment for many. After the final blessings, (and stuffing myself with goodies), we continue to the lake. At one point the Ganesha-carryer is going one way to put Ganesha in to the water. Last holding of Ganesha before seeing Him off. Then we gather at a small temple, and get the Ganesha tray back, now with a lump of clay on it, to take home - to place where Ganesha had been, to fill the void. And that’s when I see little Sweethas sadness. And I feel sad too. To me, this is an emotional festival, on so many levels, and that’s the wonderful part of it. 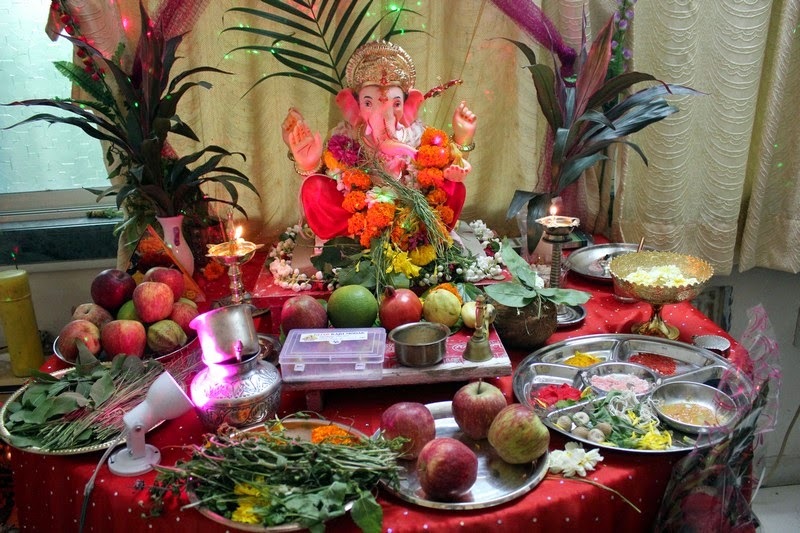 Ganesha has left, but will for sure be welcomed next year with equal enthusiasm and joy. Farewell for now, Ganesha, see you again. The festival itself is of course very intens and meaningful but not the ending by having those statues all dumped into the lake. That will cause a mass polution and WHY?! nice idea Arti to know how ganesha festival celebration from the expat perspektif, hope someday i have lucky time to join the ganesha celebration in maharastra :) still on my journey list..
A wonderful post, Eli! Your words express beautifully the joy and richness of this unique festival, and the special place it holds in the collective psyche of Mumbai-wallas. Beautiful shots of some significant moments. Great post, its nice for someone else to share their thoughts on what I'm sure is a wonderful festival. Totally agree on that, the consequences of the festival are disturbing. The sooner we go greener, the better it shall be for our own selves. What a great insight into such an interesting festival. 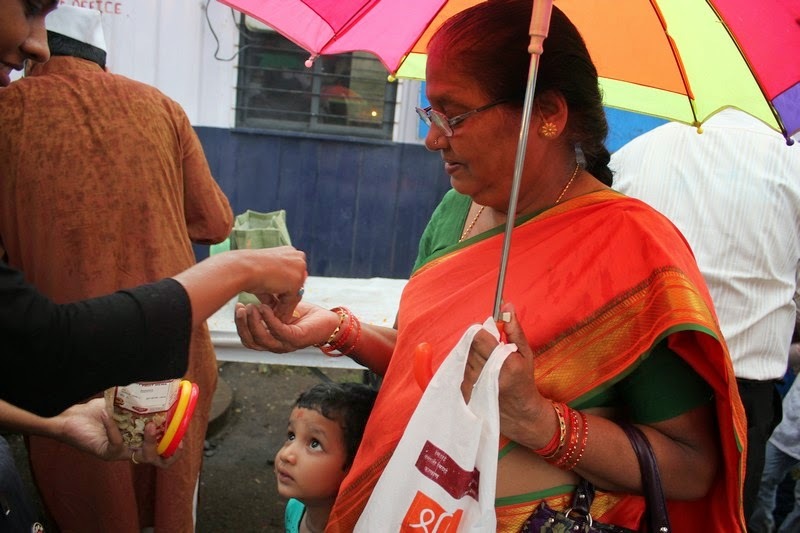 I learned quite a lot about the Ganesh Chaturthi. Lovely post, Eli. Omg she knows so many things about Ganesh Festival.That was very unusual from an expat.Kudos to her! Nice post Arti, loved it!! This is such a happy post :-) Love your big Indian festival heart, Eli!! When and where does this festival take place? The festival is celebrated across many states in India; the celebrations in Mumbai are grand. It takes place around the month of September but dates change every year so have to be checked.